Unfortunately apart from this very poor quality image from an aerial photograph taken in the 1920s we do not have any images of this house. In this photograph it is just visible in the middle of the picture, on the right hand side of the road and facing directly onto the road. We’ve collected quite a lot of information about the house, the owners and occupants. We are grateful to South Gloucestershire Council for allowing us to photograph and record the deeds and documents relating to many properties in Thornbury, including the packet for 3 Bath Road. This has given us access to records that relate the history of this property from when it was “wasteland” in the manor of Thornbury, through to the time that Thornbury District Council acquired it for development and turned it into the modern equivalent of a wasteland – a car park. Blayes. 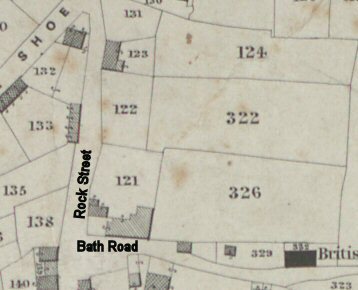 There are documents in the packets of deeds for both 1 Bath Road and 3 Bath Road that date from at least the first part of the Eighteenth Century and appear to relate to a neighbouring close of ground. This close was called Blayes and it seems later to be described as numbers 326 and 322 on the 1840 Tithe Apportionment Map owned by Thomas Osborne Wetmore. At various times the property on the land and the close called Blayes had the same owners and it is possible that their earlier history is more closely linked. The property may have consisted of a cider mill and mill house on the site of 1 Bath Road and some land on that of 3 Bath Road with a larger piece of land consisting of an orchard and close,which came to be sold off separately. Henry Howard made the stipulation that he and his heirs and their servants were to be allowed “ingress and regress” “at all seasonable times.” William Slain had to pay 5/- a year rent for and during three life times as was the custom at this time. William Rolph as attorney for Henry Howard was nominated to collect the rent. William Slain (sometimes William Slaine) – William Slain leased the land on January 2nd 1828 from Henry Howard who was Lord of the Manor. At that time William agreed to pay 5/- a year rent for three life times – that of himself, his wife and his daughter Louisa. At the time of the indenture with Henry Howard in 1828 William was said to be 26 years old and Thirza his wife 23 years. Their daughter Louisa was ten months. The property was then described as part of the wasteland of the Manor of Thornbury. We know that William Slain had built a house on this by March 1832 because it is referred to in indentures that he made with George Cossham in that year when he transferred the lease of the house to George. William and his family appear to have lived in a neighbouring house which later became known as 2 Bath Road. William was born on 25th July 1799 and baptised in Thornbury on 25th August 1799, the son of Charles Slain and his wife, Ann (nee Morgan). We have not yet found the record of his marriage to Thirza. William and Thirza had two daughters. One of these, Louisa, was baptised on 12th December 1824, must have died young as a second daughter was baptised on 29th April 1827 named Louisa Jane. The 1841 Census shows that William was a carpenter aged 40 living in Bulls Lane (Bath Road) with his wife, Thirza aged 40 and Louisa aged 14. The 1851 Census shows that William, then described as a master wheelwright was aged 49 was living in ‘St John Street’, although we believe that this was the house which later became known as 10 Pullins Green. He was living with Thirza aged 48 born in Latteridge, their daughter Louisa aged 23 and Louisa’s son, Charles Robert Slain aged one and a visitor, Mary Ann Sellman, late a cook aged 23 from Alveston. Charles Robert Slain was baptised on 7th July 1850 at St Mary’s Church in Thornbury. The parent was shown as Louisa Jane Slain. Louisa Jane did not marry for several years. On 24th June 1856 she married Luke Mills, a mariner and the son of Michael Mills, a labourer. On 2nd May 1853 William bought a cottage in Gillingstool (Plot 521 on the 1840 Tithe Map). The purchase price was £33. It must have been a very old cottage as within a year he had knocked it down and was erecting a new one which still stands today on the corner of Oakleaze Road and now called 29 Gillingstool. An indenture of mortgage which he arranged with John Hodges for £35 shows that the property was ‘the ancient site of a cottage’. This new cottage became William’s home. The 1861 Census shows that William and Thirza were living in Gillingstool with their daughter Louisa Jane and her husband, Luke Mills, and their children: Mary Elizabeth aged two and Charles William aged one. Thirza died aged 58 and was buried on 26th August 1862. William died on 15th September 1870 aged 70 and was buried on 18th September 1870. In his will dated 28th March 1867 he left his property to his daughter, Louisa Jane, the wife of Luke Mills. The 1871 Census shows Louisa Jane Mills continued to live in Gillingstool with her son William than aged four and two lodgers William and Elizabeth Griffiths. Luke Mills died in March 1888 aged 68 and Louisa Jane Mills died in Thornbury in November 1894 aged 68. Jane Hancock. By releases of 6th and 7th Feb 1837 Jane Hancock a widow made an agreement with Henry Howard, William Slain and George Cossham. She paid fifty five pounds to George Cossham for the land and the cottage in which she was then living. She paid Henry Howard six pounds and five shillings for the lease and ten shillings to William Slain for giving up the lease. This means that Jane Hancock now owned the property freehold. The 1841 Census shows us that Jane Hanock was aged 76 and of independent means and she was living with Hannah aged 30, Elizabeth aged five and Susannah aged two. Jane died aged 76 and was buried 25th February 1843. Jane had been married to James Hancock a blacksmith in Oldbury on Severn. Their daughter Hannah was born on 20th March 1810 and baptised in Oldbury on 20th June 1811. We don’t know when James died. The records indicate that their daughter Hannah had three illegitimate children; Elizabeth baptised 20th May 1832 at Oldbury, George baptised on 23rd July 1834 when Hannah was in the Poorhouse in Thornbury (George died there after only six months) and Susannah baptised in Thornbury on 14th September 1842. The excellent Scribes Alcove Website (which is the source of much of our information about parish records) gives the name of the mother of Susannah as Harriett. Susannah was living with this family and we do not know if there was an error in the records or if Susannah was someone else’s child who was taken into this household. On 30th day of August 1841 Jane Hancock sold the cottage she was living in and three parrocks of land to Thomas Facey a shopkeeper for £50. The cottage was bought in a very unusual way. At the time she sold it it was described as “wherein the said Jane Hancock doth now dwell,” and it seems that she would continue to do so. A note on the indenture said that half the purchase money was to be paid in weekly payments of 5/- a week and half in “shop goods.” Jane was allowed to occupy the house until the purchase money was paid. The method of payment and the fact that it was arranged in this way to enable her to continue to live in the house seem to suggest that Jane was struggling to survive. Jane died in 1843 and was buried on 25th February. Thomas Facey. Thomas Facey, described as a shopkeeper, bought the property on 30th day of August 1841 for £50. Half the purchase money was to be paid in weekly payments of 5/- a week and half in “shop goods.” Thomas Facey sold the property to Thomas Wilson in an indenture of 16th July 1873. Thomas Facey was born on 9th April 1797 and baptised on 14th February 1798. He was the son of Thomas Facey and his wife, Martha (nee Rymer). On 12th April 1830 Thomas married Mary Ann Hookway in Thornbury. Mary Ann Hookway was born in Crediton, Devon. According to a family tree on the Ancestry website she was the daughter of Robert Hookway and his wife, Elizabeth (nee Norman). The IGI says she was baptised on 30th May 1802 at Saint Giles-In-The-Wood in Great Torrington area in Devon. The Trade Directory of 1839 describes Thomas Facey as a pork butcher and shopkeeper. He seems to have run a general shop. At the time of the 1840 Tithe Survey Thomas was listed as a tenant living in Plot 147, a house and court at the top end of St Mary Street on the west side behind the Exchange (now the Knot of Rope). The 1841 Census shows Thomas was a shopkeeper aged 40 living with his wife, Mary Ann aged 33 and their children: Frederick aged 10, Edwin aged 5 and Mary Ann aged 9 months. Also living with them at that time were Elizabeth Rymer aged 11 and two servants, Mary Cossham aged 7 and Priscilla Hughes aged 9. Thomas and Mary Ann Facey had a large number of children: Frederick Giles baptised on 4th May 1831, Francis Hookway baptised on 15th May 1833, Isabella Maria baptised on 15th July 1835, Edwin Henry baptised on 18th March 1838, Mary Anne Laura baptised on 27th September 1840, Anna Maria baptised on 12th February 1843, Arabella Maria baptised on 2nd February 1845 and Herbert Burrington baptised on 26th January 1848. Of these children, Isabel died aged 1 and was buried on 6th July 1836. Thomas was described as a carpenter in the baptism records from 1831 to 1835. He was described as a shopkeeper in 1838 to 1840, as a grocer in 1843 to 1848. The trade directories list Thomas as a pork butcher and shopkeeper in 1839 and thereafter as a grocer and dealer in sundries or as a shopkeeper. On 8th October 1845 Thomas and Mary Ann paid £2 to Samuel Spill to purchase a stable and premises in Bulls Lane (Bath Road) which was owned by Hector Maclaine. By an indenture of 30th December 1857 Thomas raised a mortgage on his property in Bath Road from Isaac Budgett. The 1859 Rate Book also shows that he owned a number of properties; a house in “Back Street ” occupied by Jessie Cossham, a house and orchard in “Back Street” occupied by Hester Allen and a house in Bulls Lane that he occupied himself. He never owned the property in St Mary Street where he had lived for many years. In the 1861 and 1871 Censuses Thomas Facey lived in Chapel Street which was also known as Rotten Row. In 1861 Thomas was described as a carpenter and his wife Mary Ann as the shopkeeper. Of their daughters, Anna Maria was a dressmaker aged 18 and Arabella an apprentice aged 16. Mary Ann died on October 25th 1870 and was buried in Thornbury on October 30th. On 2nd January 1863 the Inspector of Nuisances presented Thomas with a notice of nuisance existing upon his premises in Bull Lane (Bath Road). The Board directed Thomas to abate the nuisance otherwise he was threatened with court action. In 1871 the widowed Thomas lived in Chapel Street. He was described as a carpenter with his daughter Arabella a dressmaker and their servant Mary Ann Comely aged 16. Thomas had not owned this house either – the 1867 Rate Book shows it was owned by Jesse Cossham and the 1876 Rate Book shows Elizabeth Tanner was the owner. Thomas Facey had borrowed £70 from Isaac Budgett using his Bath Road property as security. When Isaac wanted his money back, Thomas Facey raised another loan from James Parnell of £80 which enabled him to pay back Isaac and gave himself £10. This transaction took place in June 1865. In an indenture of 16th July 1873 James Parnell was represented by his sister Frances Stephens a widow as James himself was serving in the army. Thomas Wilson bought the property. Because £55 had already been repaid to James Parnell, this indenture settled the outstanding debt with a further £25 paid to Frances Stephen and £11 to Thomas Facey. Mary Ann died on 25th October 1870 aged 63 and was buried on 5th November. In 1871 Thomas was listed in the same house. He was shown as a carpenter and shopkeeper living with Arabella a dressmaker aged 26. Thomas died aged 78 and was buried on 4th July 1876. Francis Hookway Facey was baptised 15th May 1833 and died in 1901. Francis married Sarah Hopton the daughter of Charles and Hannah Hopton. Isabella Maria Facey was baptised 15th July 1835. We know nothing more about Isabella. Arabella Maria Facey was baptised 2nd February 1845. We do not know what happened to Arabella. Henry Barrington Facey was baptised 26th January 1848. We do not know what happened to Henry Barrington Facey. By his Will dated 2nd January 1880 Thomas Wilson, grocer and beer house keeper bequeathed all his property of every nature to his wife, Anna Maria Wilson. Thomas died on 4th January 1882 and his Will proved on 4th July 1882. On 19th October 1885 the Will of Anna Maria Wilson of the Horse Shoe Inn widow appointed George Wilson, her brother in law of 15 New Thomas Street St Phillips, Bristol wheelwright and Thomas Honeyborne of Morton butcher as trustees and executors. She left all her estate to them on trust. On 16th November 1885 Anna Maria Wilson died and on 9th February 1886 the Will was proved. Her estate, including number 3 Bath Road, continued to be managed by her trustees. One of the trustees, George Wilson died on 5th September 1892 so Thomas Honeyborne became the sole trustee. The house was advertised for sale on 15th February 1896 together with other property owned by Thomas Wilson. It was sold for £60. Henry Baylis. On 25th March 1896 Thomas Honeyborne as executor sold the cottage and its land to Henry Baylis for £60. At that time the tenant was John Savery. Perhaps Herbert Sherborne or Henry Baylis had modernised the property as it now seems larger than the three rooms of 1901. Norman John Rogers of the Hollies Rockhampton, Falfield bought the property from Herbert Sherborne on 30th September 1948 for £600. The 1950 and 1954 Electoral Registers show the house was occupied by Norman John and Olive Mary Rogers. We understand that Norman worked for the Thornbury Grammar School on the maintenance side. On 16th August 1956 Norman (described as an employee of the Salvage Department) sold the property to Francis Hopkins for £300. We have been told that they left to move to Berkeley. The property then appeared to be bought by people interested in it as a speculative investment. Leslie Albert Smith, a builder of Oaklands Building Estate, Oldland bought the property in August 1956 for £1300. He sold it in February 1960 for £1300. St Anne’s Investment Company Ltd bought the property from Leslie Albert Smith on 11th February 1960 for £1300. The purchase included the entire property referred to above including the garden land associated with 1 Bath Road. Number 3 Bath Road was included in the sale, although it was still being noted that the house was ‘condemned’. Thornbury Rural District Council bought the property from St Anne’s Investment company on 5th April 1967. The price was £11,100 for the entire property as above, except for the house at 3 Bath Road which appears to have been demolished. The whole site then became part of the town’s re-development scheme and it has now been replaced by Rock Street car park.